I used to wear nail polish everyday and I do not know why I am slacking. My personal grooming is not like what it used to be for nails that is. I am a constant recovering nail biting addict. I do not bit my nails like when I was little girl. Though I do pick at them on occasion. I recently bought a cute nail file that has its own pink carry case that I now carry in my bag. I have seen some beautiful nail colours on blogs and videos. Clumps of Mascara always talks about and shows pics of beautiful nail colours. So much so that I dug out my nail polish collection. When I was all about my nails I easily had about 30 different colours of purple. One of my favourite colours. I am happy to try any shade at the moment. I love the look of French manicures too. Black tips with bits of gold or silver always look nice. My new French manicure kit is by L’Oreal and comes with an angled brush to make applying the white tips easy. I tried it and its ok. Though I guess I may need more practice with it. I am contemplating whether or not to spend £28 on a full set of acrylics or try do it myself. Or simply just shape and polish my own nails myself. YouTuber Goldenchild789 did a video on doing your own acrylics. Her nails look lovely and I was thinking mmm I wonder if I could do that myself. 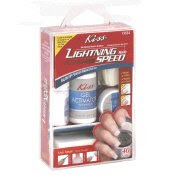 Th en when I went into boots I came across the Kiss Lightening Speed Acrylic Nail Kit. So I am not sure if I should go and buy a salon pro kit or get this starter kit and if it works voila credit crunch nails that look adorable. Undecided but I get my wages soon and I might just treat myself to the Kiss kit or a nail art set or something! !